The UN SDG Action Awards recognize outstanding achievements and innovative efforts to promote action on the Sustainable Development Goals. In order to achieve Agenda 2030, we need to learn from some of the greatest innovators, mobilizers, connectors, storytellers, communicators, visualizers and includers from across the Globe! This awards program aims to find these change-makers and celebrate achievements being made in every corner of the earth, which all form a critical contribution to the international sustainable development movement. The Awards are open to individuals, civil society organizations, local governments and others who are taking actions to advance the 2030 Agenda. 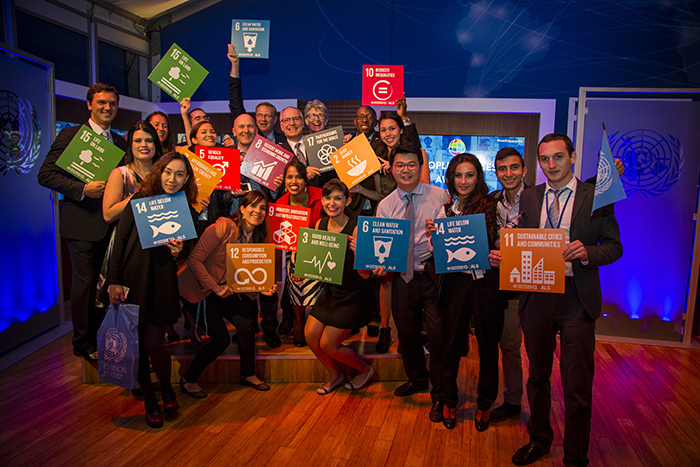 Members of the global SDG community were invited to enter their projects, initiatives, networks and people for the chance win a UN SDG Action Award at the UN SDG Action Awards Ceremony on 21st March 2018 during the Global Festival of Action for Sustainable Development in Bonn, Germany (21-23 March 2018). Where applicable, award winners will also be invited to offer practical, hands-on workshop sessions at the Global Festival of Action for Sustainable Development to share their skills and good practices with participants. The winners will be recognised at an Award Ceremony held on the first evening of the Festival, 21st March 2018. This award goes to the team that demonstrates greatest successes with mobilizing citizens or volunteers to act for the SDGs. This award goes to the team that captures powerful human stories to help communicate the importance of the SDGs to people’s lives. This award is for the most creative or impactful communications campaign (local/national/international) to raise awareness about the SDGs and/or people’s voices and role in SDG action. This award goes to the most innovative or impactful use of MY World or other citizen voices data to communicate with government or the public. This award goes to the most creative and innovative use of new technologies for communicating SDGs. This award goes to the team/person with that demonstrates innovative or impactful ways to bring multiple stakeholders together, or building networks, towards SDG Action. Leave No One Behind – This award goes to the group who make the most extraordinary and impactful effort to ensure that excluded groups become part of the SDG dialogue and implementation in their community.